After returning from Ubajara on Thursday night, we spent the weekend in Fortaleza, where we had a family function (I cooked Chinese!) attended by all my aunts and several cousins I hadn’t been in touch with in quite a while. That same weekend, we also met with former co-workers from IBEU at the same social club I’d spent time with my relatives a week earlier. There was a good band playing a mix of bossa, samba and popular music. We enjoyed a few hours with them reminiscing about the past and also catching up with each other – it was a really good time. Sunday morning we rose early and caught the bus to Jericoacoara, a famous beach town on the northern part of Ceara state. Luckily for us, the bus leaves just a block and a half from my mother’s apartment, so we did not have to schlep all the way to the interstate terminal. The trip was very comfortable – there were no stops, and a light snack was served about an hour after we were on the highway. About 1:30 PM we reached Jijoca de Jericoacorara, a small village where we’d switch from our air-conditioned transport to the “Jardineira,” which is really a 4×4 Toyota truck fitted with wooden benches in the rear. 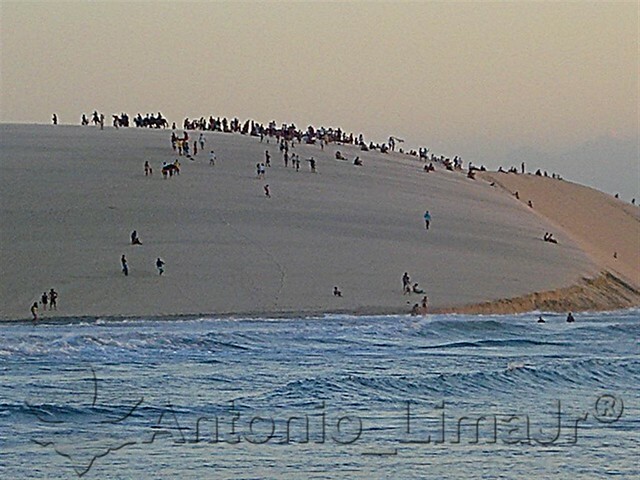 The reason for this is that Jericoacoara is a preservation area, so there are no roads to the town. The trucks go over a dirt road and also sand dunes – a one-hour ride that is an attraction in its own right. We passed through various country homes, and the smell of cashews – which were in season at the time – was everywhere. I tried to take a few pictures during the ride, but the Jardineira rocked so much that I was afraid I’d drop my iPhone. When we reached Jericoacoara, we were amazed by the fact that there were no real streets or anything like that – just sand. We quickly located our hotel (which we’d booked a month earlier) and proceeded to do our check-in. Most hotels in the town are what they call ‘pousadas’ – basically bed-and-breakfasts that grew over the years and evolved into full-blown hotels. Most were built by Europeans who traveled there, fell in love with the area and moved out there to start their own businesses. Ours – recently renamed My Blue Hotel (it was called Mosquito Blue before) was no different. The service was impeccable. The employees at the front desk all speak English (not that I need that), and the hotel is a wonder to the eyes – beautiful gardens, two swimming pools, free WI-FI, a media center with computers, games and a large TV with DVDs, a full restaurant on the beach and also an area with hammocks to lie down and watch the day go by. The rooms were very comfortable – cable TV, two large beds, a nice bathroom and a small refrigerator stocked with beer, water and soft drinks. We rested for a while and went for a walk around the village. We stopped to refresh ourselves with some cajuina then walked to the beach. The sun sets early in those parts – around 5:30 – so we proceeded up the sunset dune (Duna Por-do-Sol), where we watched the sun go down along with another 100 people or so. In the past, people would be smoking weed there, but since there were quite a few cops in the area, most just drank beer or caipirinhas. After that we found a small supermarket, and we got some bread, cold cuts and beer for a light dinner (we avoided eating in restaurants, since prices there were quite high). We rested a bit and headed out again later at night. Being this a Sunday night, there was little to do – a guy was playing his guitar at a small restaurant, but there was little else going on. The next morning, we rose early and had a nice breakfast at the hotel (as I wrote before, hotels are required to supply breakfast in Brazil). There was bread, cold cuts, hot sausages, pastries, cake and fruit. You could also order an omelet, but neither of us had any. After that we just lay on the beach and enjoyed the sun for most of the morning, heading to the ocean to refresh from time to time. Late in the afternoon, we decided to walk over to the famous Pedra Furada, a large stone arc that has become the symbol of Jericoacoara. The rock is located about a mile and a half from where our hotel stood, and there were two ways to get there: through a path over the hills or over the shore during low tide. We decided for the latter, and set off. On the way, we befriended one of the many dogs that wander the area (they have owners , but they pretty much roam the beaches on their own), a white puppy we nicknamed “Freddie.” He followed us for the entire way, which included going over dunes, rocks and narrow paths. It was not easy, but it was worth it: the views were breathtaking, and it was also good exercise. We made it to the rock just in time for the sunset, and what an experience it was. There were a few visitors there as well, and we took pictures and enjoyed the view as long as we could. As the night fell, we walked back using the easier path, and as we reached town we bought more bread and cold cuts – which we shared with Freddie (he stopped following us as soon as we were back). Later, we bought cocktails from the street vendors and took in the village’s vibe. The next day, we took it easy – we did walk a lot around the beaches (Renata wanted to take more pictures) and we once again saw the sunset over the dunes. On our last day, we just lounged, had an inexpensive lunch at a small restaurant (we just followed the bus drivers) and waited until it was time to leave. 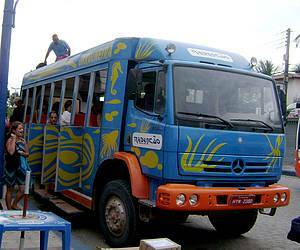 We once again took the Jardineira back to Jijoca, and an hour later we were ready to board our bus back to Fortaleza. We were dropped off just a block from my mom’s , and then I went to the supermarket to get a few supplies for a pasta dinner. Jericoacoara was an amazing experience. Because we went during the off-season time (and we went in the middle of the week), we missed out on the town’s famous nightlife, but it was all good. At the end, we were well-rested – and still had almost a full weekend in Fortaleza before coming back home.